Luton boss Nathan Jones is ready to kick off the League One campaign with a bang after the opening fixtures were announced yesterday. The Hatters begin the season at Portsmouth on Saturday, August 4, before entertaining hot favourites Sunderland a week later, who came down from the Championship last season. On the two matches, Jones told the club's official website: "It’s a tough start but a really good, interesting one – there are some really good games to whet the appetite. "We know it will be a difficult start, but it’s going to be a tough league throughout. We are under no illusions about that. "I know the coaching staff at Portsmouth really well and we’ve had some rivalry. We’ve had similar pathways really in terms the problems off the pitch which meant that they were playing in a league that they didn’t want to play in. 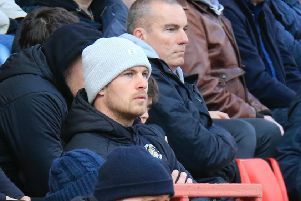 “It was tough for them to get out of League Two because of the size of the club, and it was tough for us, so we’ve had similar sorts of pathways into League One. But now we are there we’ll be competing for the same goal. When speaking about Town's first home game against the Black Cats, Jones continued: "Without being disrespectful to anyone else in the league, that’s probably the biggest game you could have had for the first match at home. "It’s a great test for us. We’ll test ourselves early to see where we are, and the first two games against sides that will be high up there and favourites to get promoted, so to test ourselves against them is brilliant. “Portsmouth and Sunderland are as big a clubs as there are in the league, so to start with them is a real tough ask, but it’s one we’re relishing, one we’re looking forward to and one we’ll be ready for. Luton then visit West Bromwich Albion in the Carabao Cup, with the Baggies recently relegated from the Premier League, making it a hat-trick of former top-flight clubs they will be coming up against during August. Jones said: "As far as two-third of that opening trio of games goes, it would have been a Premier League fixture list just two seasons ago, so it shows that we’ve come a good distance, but these are the games we wanted. Hatters have been dealt a rough hand on Boxing Day though, with a trip to Scunthorpe, as Jones added: "That’s the only thing if I’m honest – I don’t know who does these fixtures or how they are done, but unless we were drawn against John O’Groats, I don’t see that we could get much further away!